If you want to be a well-rounded Brazilian Jiu-Jitsu practitioner, you should also train in no-gi submission grappling. If you don’t train both gi and no-gi, you will inevitably have serious gaps in your game. No-gi uses a lot of the same principals as gi jiu-jitsu. I some cases, it’s a bit more difficult in that you don’t have a gi to grab but rather a sweaty, slippery opponent. It forces you to focus more on center control and controlled pins, and it’s a much faster experience. 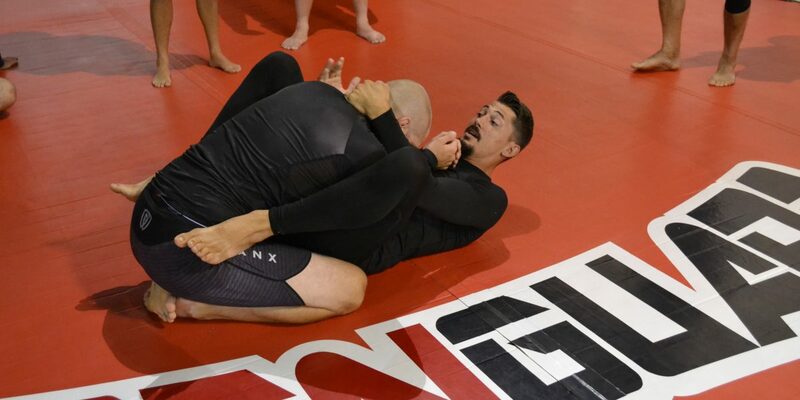 No-gi improves holds and submissions simply because there is nothing to assist your grip. When you’ve learned how to control an opponent who isn’t wearing a gi, you will be able to more easily control one who is. Many people argue that no-gi is the superior martial art because street and MMA fights won’t include a gi. Although clothing can be used in a self-defense situation, the material is not always as strong, so most techniques require you to be faster and more efficient with your grips. No-gi submission grappling will accelerate your overall Brazilian Jiu-Jitsu gi game. It will also massively improve your overall enjoyment of the sport. Come by today to check out a free class and have some fun! Copyright © 2019 Apex Martial Arts Center | Website Design & Web Hosting by BizCom Web Services, Inc.
Apex Martial Arts Center offers Kickboxing & Brazilian Jiu-Jitsu in Apex, Holly Springs, Cary, Fuquay-Varina & Raleigh, NC.